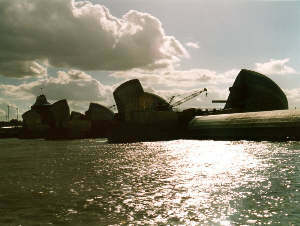 The Thames Barrier is the flood control in the mouth of the Thames, east of London. It is formed by several pillars and valves in between. 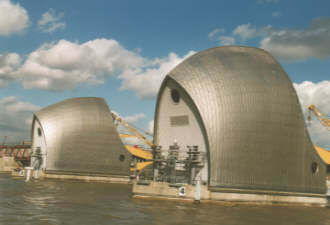 When the water level in the Thames gets too high, due to storm at sea, the valves are closed and the level in the Thames can't threaten London. 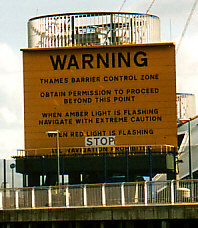 Only a short time after the Barrier was finished, the water level was so high it had to be closed. The picture above shows not history, but what might have happened. 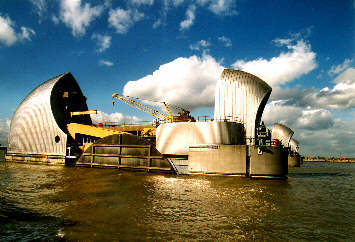 You can go by boat from Central London to Greenwich and beyond, along the Millennium Dome to the Thames Barrier. As Dutchmen we just had to do this. Off course, in the Netherlands are several dams and flood barriers like the Thames Barrier, but this one is particularly beautiful. 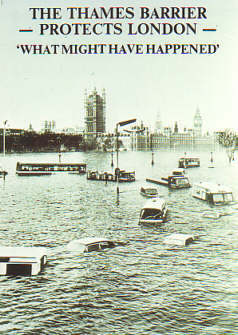 We learned with History there used to be a barrier across the Thames. This was a chain with the purpose to stop the Dutchmen from sailing to London. It didn't work, the boat broke the chain when it sailed over it. The modern barrier will be harder to cross. At least, when the valves are closed, usually there is only a traffic light to regulate the boat traffic.